All kinds of things can affect our concentration. Stress is often a cause. It can be hard to concentrate when you are worrying about something in particular, whether it’s a situation at work, your children or other members of your family. Poor concentration is to be expected after a stressful event like a bereavement, marriage breakdown or an accident. Sleeping problems can be caused by stress, and lack of sleep can affect concentration too. Diet can be a factor, also made worse by stress if you’re not eating properly or snacking on sugary things instead of eating healthy meals. It’s not just stress that affects concentration. Hormonal changes, depression, anaemia, thyroid problems (Hashimoto’s) and pain all have an impact as well. It’s also possible for adults to have ADD/ADHD, and if you think you might, you need to visit the doctor. My own concentration isn’t great at the best of times. Inside my brain is a kaleidoscope of butterflies, each one of them an idea and it’s hard to ever focus on just one! When I get tired, the butterflies get jittery, which makes it even harder to focus. I’m having difficulties with sleeping at the moment and the butterflies are very jittery, so my attention span is shorter than usual. So far there hasn’t been extensive research on the extent to which crafting can help people who are experiencing mental health problems. What evidence there is however indicates that it does help. In this article on the CNN website, psychologist Mihaly Csikszentmihalyi says that when somebody is concentrating on a craft activity, they don’t have enough attention left over to focus on other things that are going on in their lives. They lose themselves in the activity and everything else is temporarily suspended. It’s believed to have a similar affect on the brain as mindfulness and meditation. Knitting, sewing, crochet, embroidery, and other crafts are believed to help people with mild depression, PTSD and short term memory problems associated with old age. There is evidence to suggest that crafting even helps with pain. People have reported that their pain is diminished, they can manage it better and they sleep better. I wrote about the health benefits of making stuff in this post here. 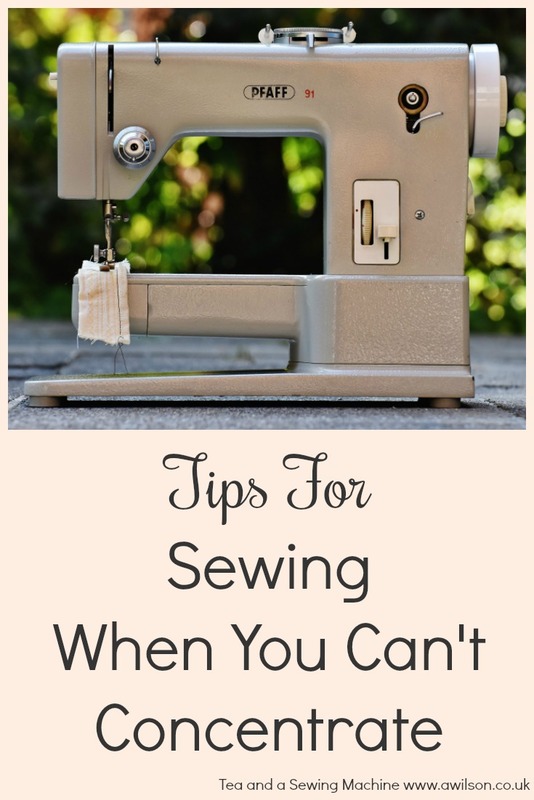 So making stuff definitely makes us feel better, But what should you do if you can’t seem to concentrate for long enough to actually get anything made? Here are some tips for what you can do when you want to make stuff but you can’t concentrate. These kind of projects require time, space and concentration! If your concentration is poor, the chances are you won’t get the thing finished, assuming you even manage to start it after you’ve got everything out. Not being able to eat at the table or do anything in the living room because there’s yards of fabric or scrapbooking stuff all over the floor is inconvenient, but our families can cope if it’s only for a couple of days. And the results will be worth it! However if it’s likely to be longer because you can’t concentrate for very long, it’s probably best to avoid these kind of projects until things improve. This ties in with the point above. If you can choose a project that doesn’t involve pulling a load of stuff out, you can work on it for a few minutes at a time when you feel up to it. A crochet project, some knitting, embroidery or a little bit of hand sewing are ideal. You can work on it for a few minutes at a time, you won’t have to get masses of stuff out, and if you suddenly feel sleepy, you can put it down and take a nap, ready to return to it later. When your concentration is bad, a quick and easy project is more likely to be completed than something longer and more involved. It will feel achievable and you’ll gain a sense of satisfaction from finishing it. Projects with lots of steps can seem overwhelming at the best of times! When your concentration is suffering, it may well prove to be all to much and end up on the unfinished projects pile. Instead, choose something straightforward that doesn’t have lots of steps. Like with projects with lots of steps, a certain amount of gratification comes with completing fiddly, complicated things. But when your concentration is bad, it will probably be overwhelming and frustrating. It’s probably better to stick to simpler things until you feel better. It’s fun to learn new things, but when you can’t concentrate, it’s probably safest to stick to things you already know how to do. Because your brain has already learnt how to do these things, and you’ve probably practised them before, it requires less mental effort than learning something new. Taking breaks enables you to concentrate for longer. On a good day, I can manage about 45 minutes, but much more than that and I lose concetration. Once it’s gone it’s hard to get it back! So I work for 45 minutes, make another cup of tea and put another load of washing on, maybe do some washing up, then go back to it. When I was making the pin cushions last week, 15 minutes was about my limit, and after a couple of hours, even with breaks, I’d had enough! FInd out what your limit is and stop just as your brain starts to fizzle. Take break, then come back to it later. Working on something for several short spells is likely to be more productive than one long spell when you can’t concentrate. It’s frustrating, especially if you’re the kind of person who likes to be busy and get lots of stuff done. But sometimes it’s just not possible. At these times, it’s important to give yourself some grace. Sleep if you feel you can. Eat properly, don’t skip meals and don’t eat too much sugary rubbish. Go out for a walk. Spend time with people you love. Do things that fill up your soul. Don’t worry too much about the other things, and if you think you might need medical attention, go and see a doctor. You are so right and I feel that sewing and machine knitting got me through my children’s difficult childhoods. They had undiagnosed , at that time, difficulties. Since then I just love to sew and although I still have a knitting machine tucked away I haven’t used it in years, Hand knitting is something I can pick up and put down. Thanks Brenda, I might try that with the times tables. I’ve been visualising myself in a forest, it works sometimes but not always. How are your children now? I have pain in my body. I tried turmeric in milk at bedtime. Sounds awful, I know. But it was not so bad. What I discovered was, it made me sleep well! It didn’t help much with the pain. Just thought I would mention that. Not sleeping makes for long days and hard to focus. I hope you get some good sleep and feel better soon. I enjoy your posts. Glad that you share things like this, too. I have lots of problems with concentration since I had my thyroid removed eight years ago. I have learned that when my concentration is good to just get as much sewing done as possible. Then when it isn’t I find other projects around the house that need to be done like the cleaning that I ignored because I was sewing. It is all just a balancing act and you find your new normal. I want to also tell you how much I enjoy getting your post. They give me inspiration. Hi Mary, thanks, I do the same kind of thing. Sewing and blogging when my concentration’s better and boring stuff like housework when it’s worse!